Imagine that you could travel around the world seeing history unfold…. 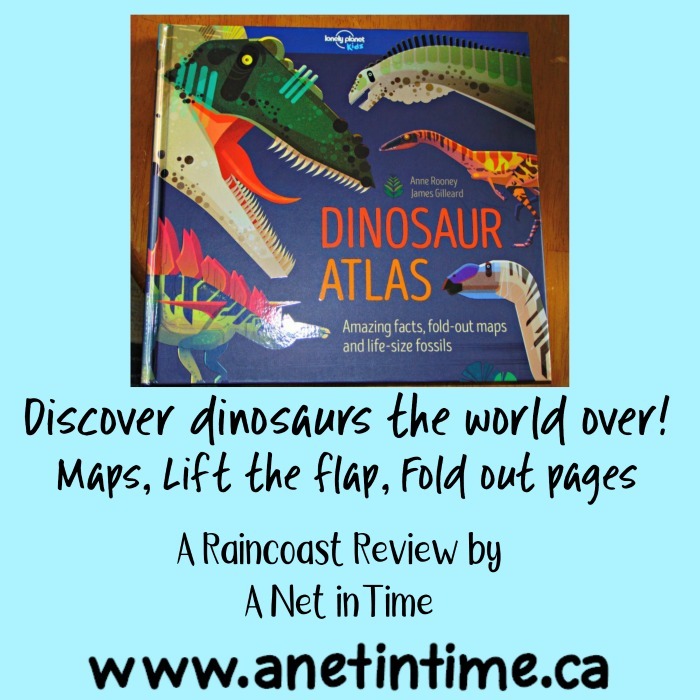 welcome to the Dinosaur Atlas. 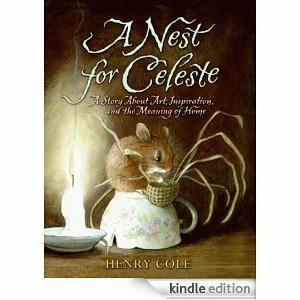 A wonderful book of unfolding pages and lift that flaps to delight and inform. This is seriously a great book for the dinosaur lovers among us, it is so packed with information. 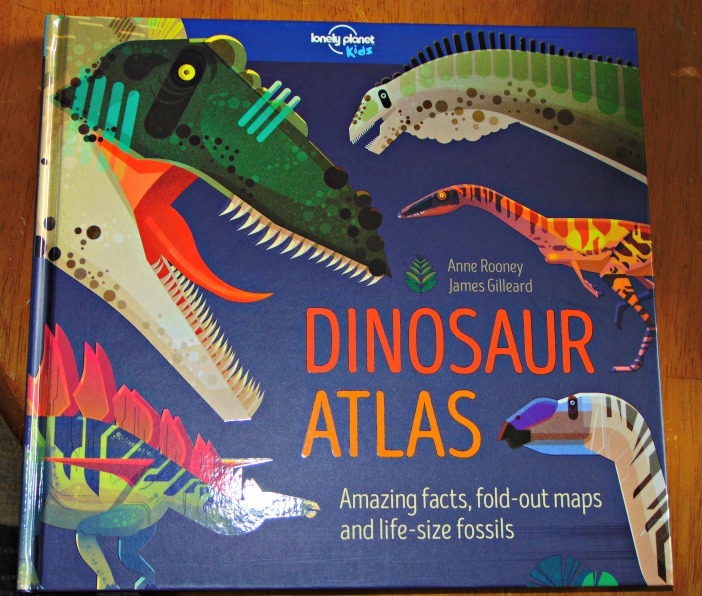 The Dinosaur Atlas comes with facts to amaze you, fold-out maps, lift the flaps curiousities and life-size fossils. 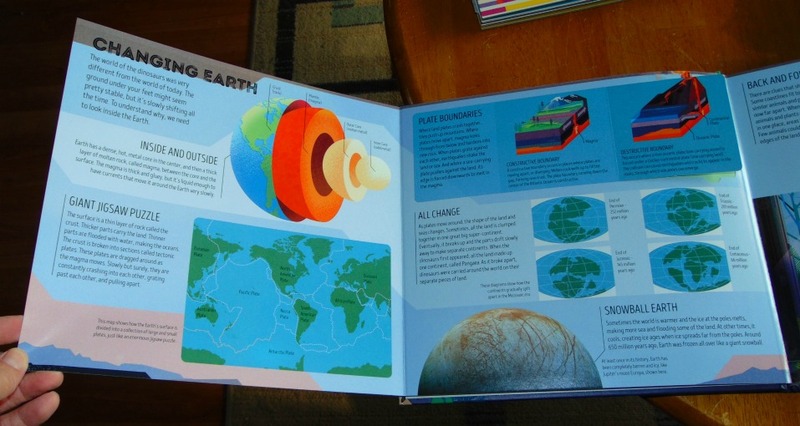 Lonely Planet Kids worked to make this an informative book to delight as you walk your way through the pages. In the middle of the book we are treated to a photograph containing the actual size jaws of a Anhanguera which lived in Brazil. Each of the pages folds out to present even more information, and the pages are printed on a heavy stock paper… thte quality of board paper. 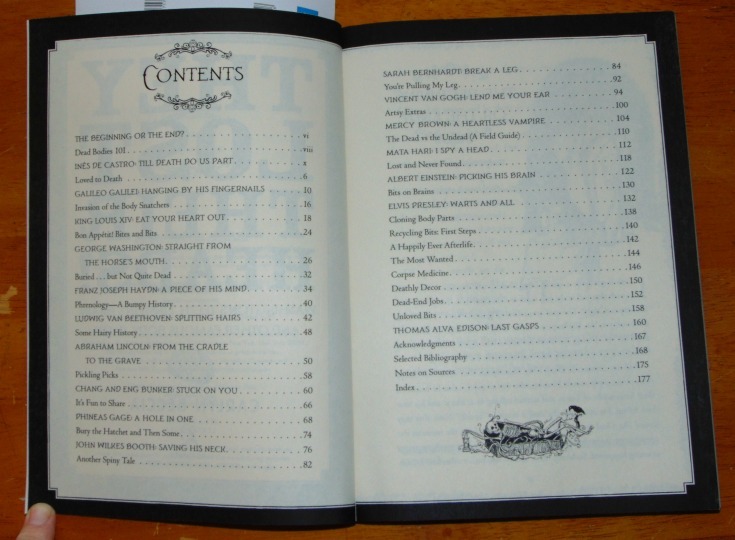 Sometimes they included lift the flap pages. Regardless of how the information is presented, you’ll be surprised at the sheer amount you learn… like did you know there were dinosaurs who shrank due to living on a small island? Or that there were dinosaurs that had scales and feathers? Or even that dinosaurs have been discovered in Madagascar? I KNOW.. tons of information, some of the facts caught me off guard, others were like old friends reminding me of their presence. 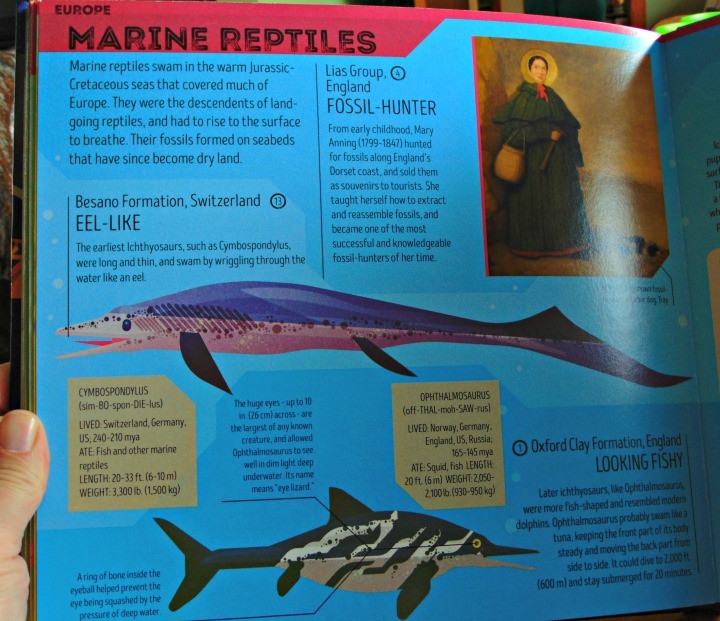 Maps contained through the book told the story of where these dinosaurs came from. 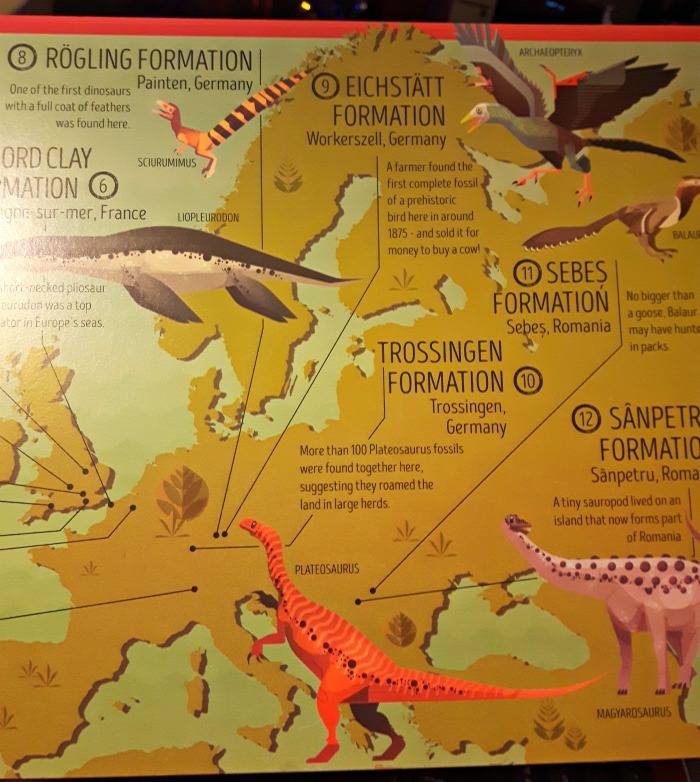 Dinosaurs have been found on every continent… even Antarctica! Though many of the drawing were illustrations, some photos are included as well. Dinosaurs and all the information surrounding them are brought to life. Sometimes it is very hard when nature collides with human activity, hard decisions need to be made. What can a boy do? Obey his dad, or….follow his instincts? 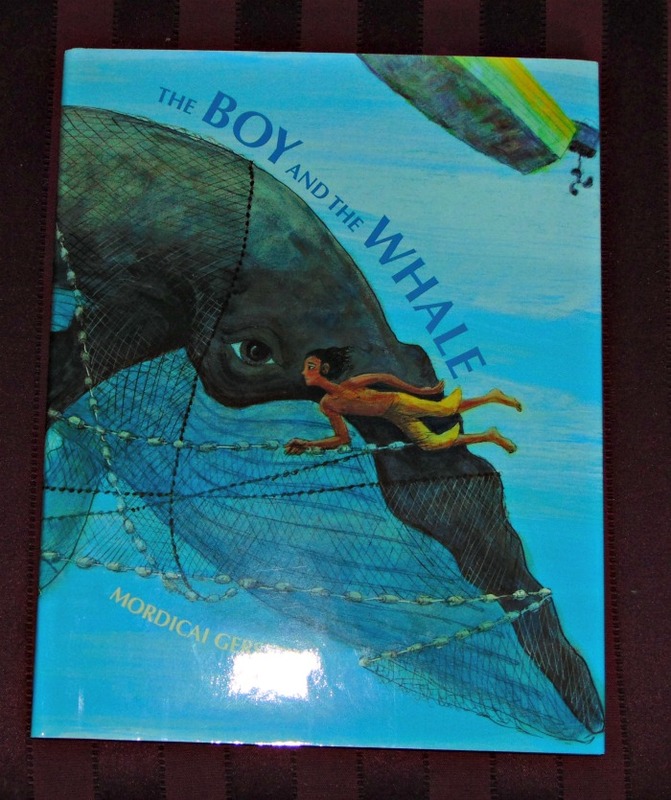 We see this struggle in “The Boy and The Whale”. 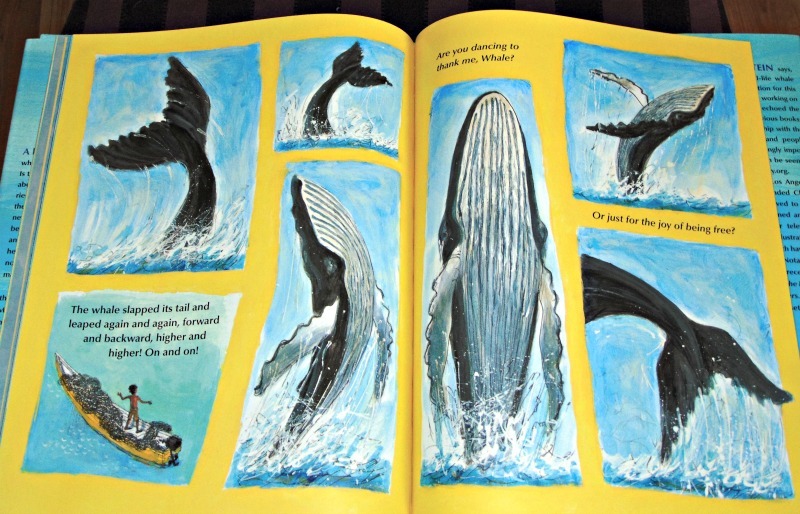 This carefully illustrated book brings to life the struggle this boy had. What should he do about the whale? And this review is SO hard to write because I don’t want to give the story away… cause you know.. that spoils the fun of a good book to read. 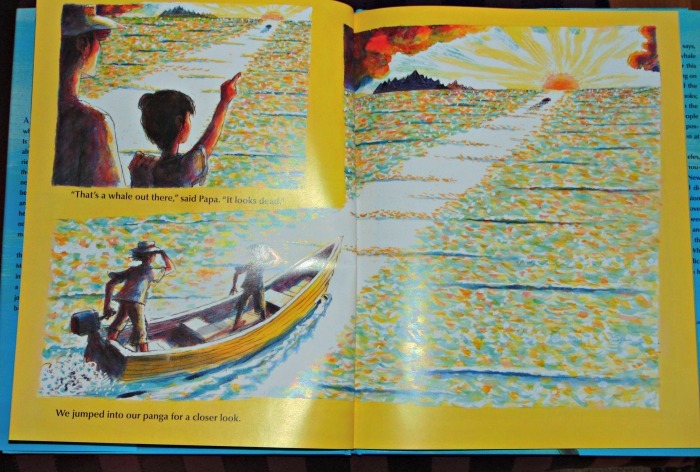 I think it would be a delight to sit down with a younger child and just enjoy looking at the pictures as we read the story together. 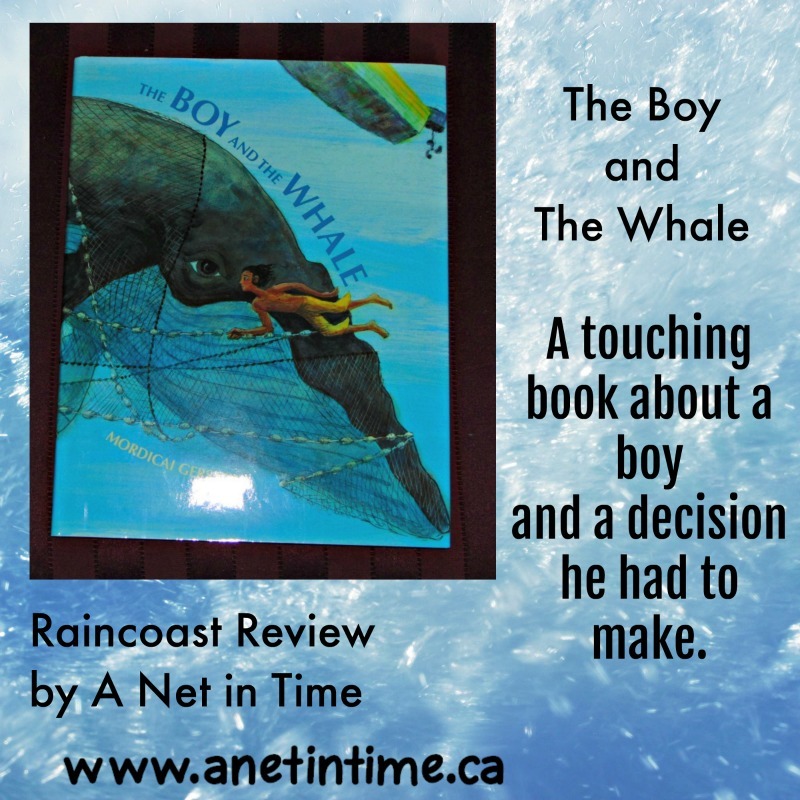 Sharing a boy’s need to breathe, a whale’s need to breathe and for a father to connect with his boy when a boy makes a difficult choice. This would make an excellent book to show the push and pull about human influence on the world and some of the difficult decisions that need to be made. 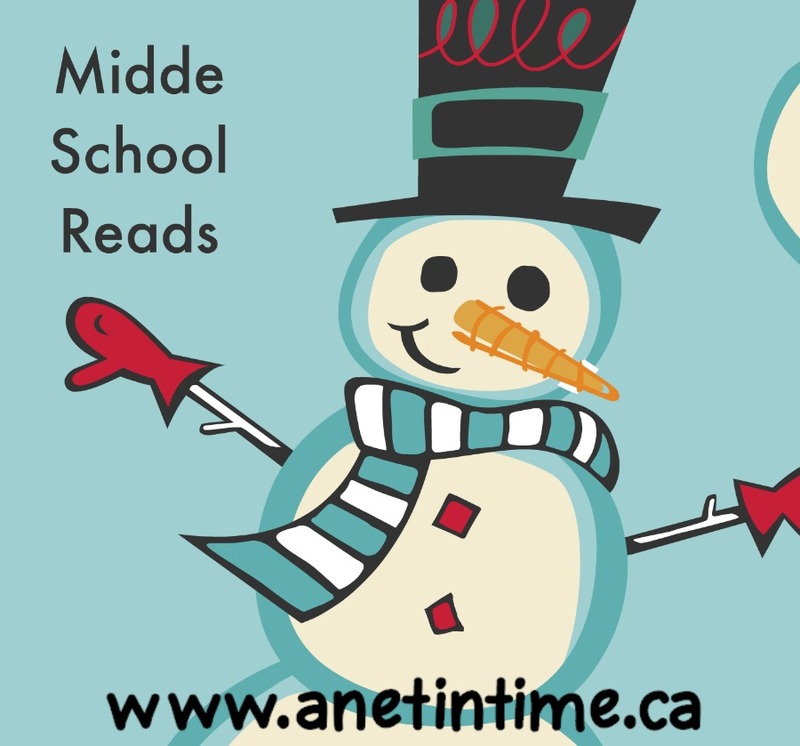 Mmm… middle schoolers…some love books, and some have yet to learn the joy of the written word, here are some books that might peak their appetite. They’ve all been enjoyed in our household. If I wrote a review, I’ve provided a link to go along so you can see what we thought of it. 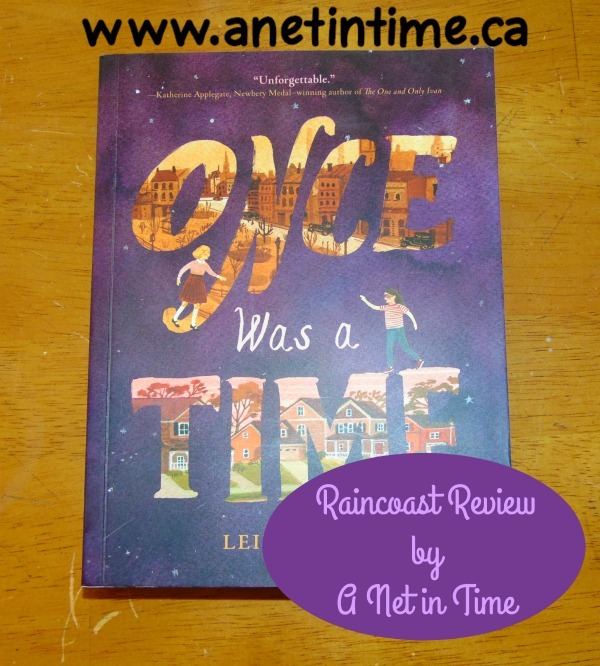 Time Travel and friendship are the main themes of this middle school book. 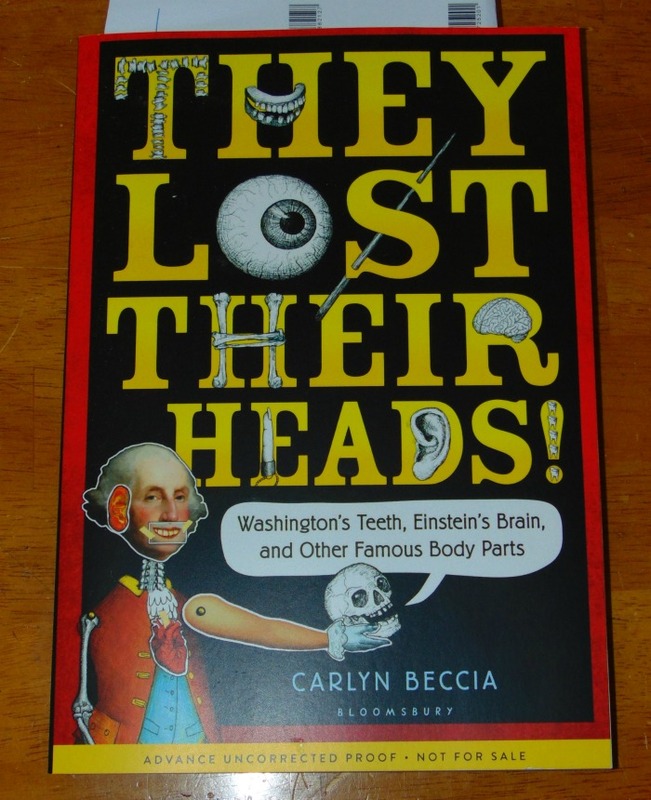 I thought this book was an excellent read and am looking forward to seeing my son’s reaction to it. Go look it up. I read it ages ago and currently am reading it with my lad. He’s very much enjoying it. This book is still a favourite. Good for upper elementary through middle school (or even beyond). Pete Milano’s Guide to being a Movie Star. SuperHeroes Don’t Eat Veggie Burgers. 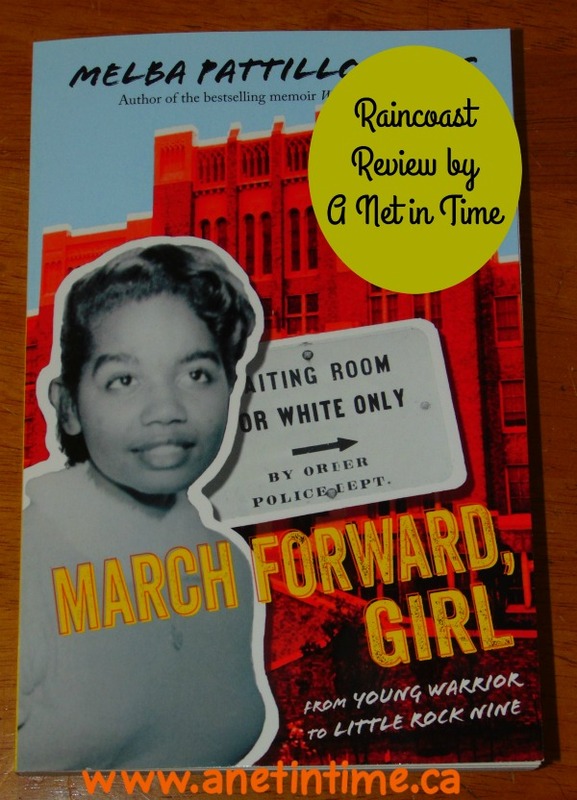 An interesting book about racial inequality in the south in the 1940’s. A tough read. But not a bad book at all. Just hard to read some of the things that happened when the Jim Crow laws were in effect. Time Stoppers. The lads and I have thoroughly enjoyed these books. Dad waited IMPATIENTLY for the lad to finish book one and has been enjoying it since. I got the lad started on a different book so dad would be able to read book two instead of having to wait three months for the lad to finish the second in the series. 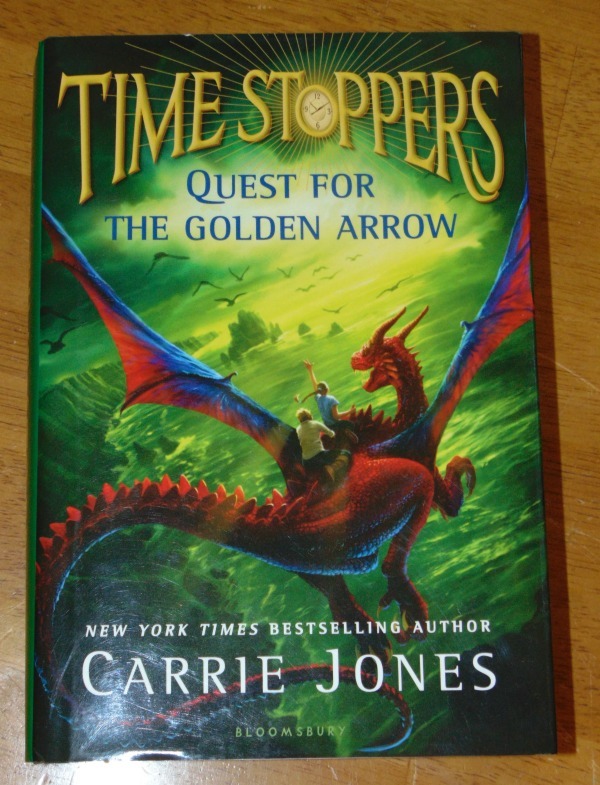 Book two proved to be just as interesting to me as book one…. has me wondering if there will be a book three and just when will it come out. 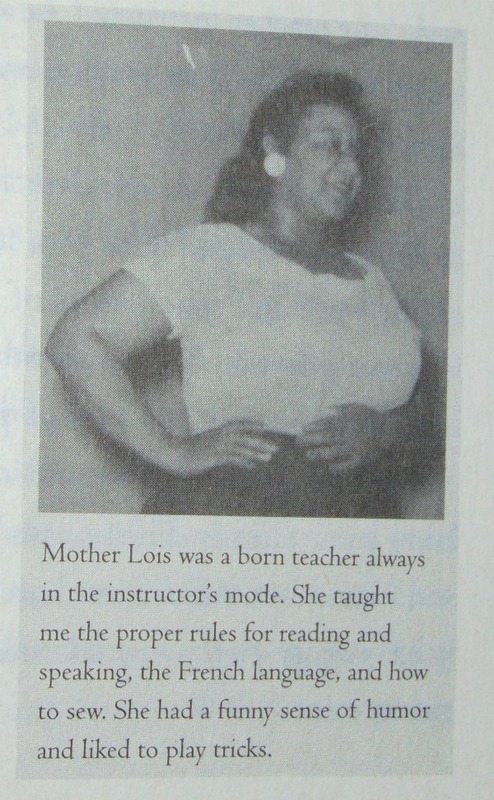 Oh.. imagine being in the mind of an African-American girl growing up in Little Rock, Arkansas in the 40’s and 50’s. This is the story of Melba and how she was taught to live her life, even as inwardly she railed against it. Segregation was a horrible thing. The fear, the anger, the shame and the outrage. It was a hard time of living. I have to admit, the events of this book are so outside my paradigm of experience and even as I read the book and experienced Melba’s life through her eyes, a part of me didn’t really believe what I was reading. Could people truly be so mean? So unthinking? 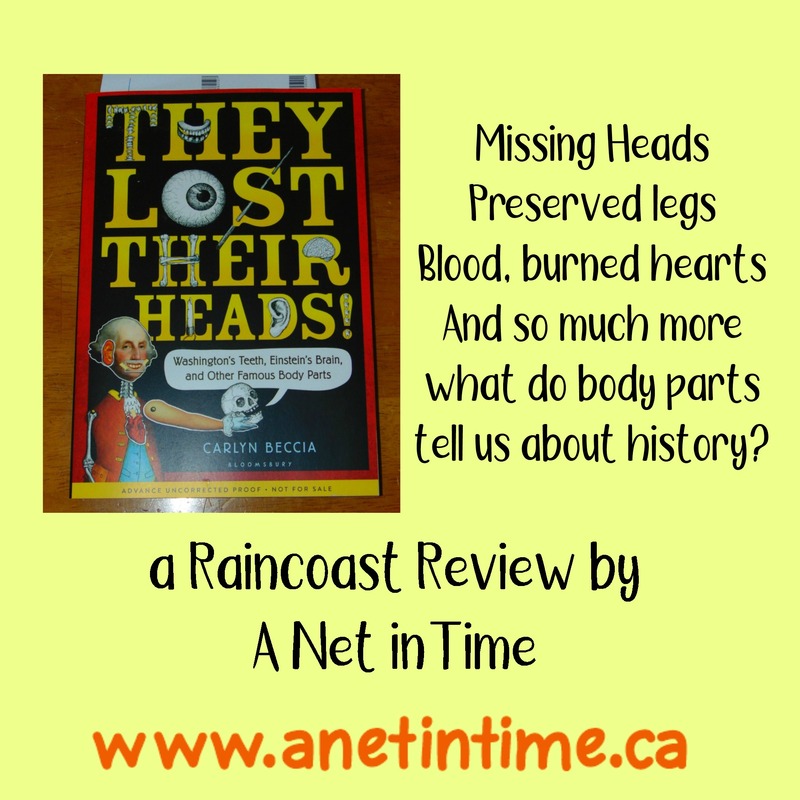 Then I had to ask myself this question: Would I want my 12 year to read this book? 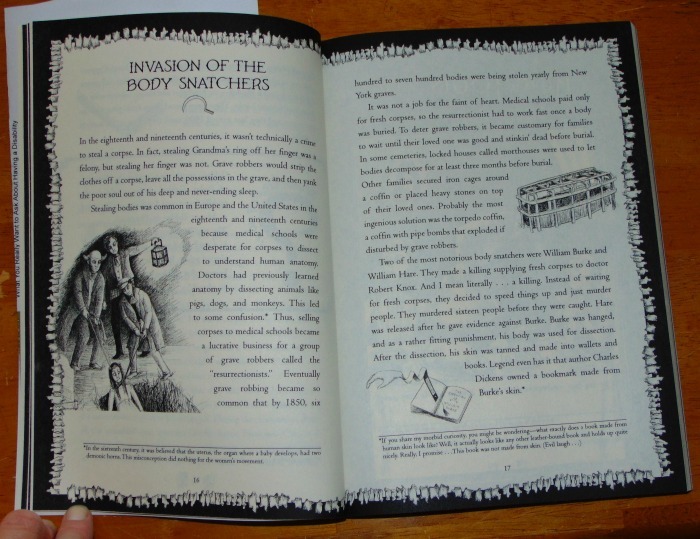 It’s geared for middle school… but would I truly want him to read it? He’s a sensitive minded lad who has been raised to realize there are horrors and bad things in the world, but do I really want him reading about it now? And honestly I don’t know. Melba paints a very real picture of what life was like for her and her people. The needing to give way, the living in fear, as well as the sheer joy that comes from living with family and having people who genuinely care about your life. AND oh..there was joy in the midst of it all. The mixture of the joy with the anger providing good juxstopotion that made it all so much more real. I want to tell you how the book ends, but that’s not my role here. My role is to tell you what I thought abour March Forward Girl. It was a good book, a needful book to read, and I enjoyed watching Melba mature in her ability to think and DO in her fight against the injustices in her life and in the lives of the people around her. I still am not sure about sharing it with my middle schooler, though I might read it with him, that would be a good thing I think. I think it would be could talk about the things we read together. 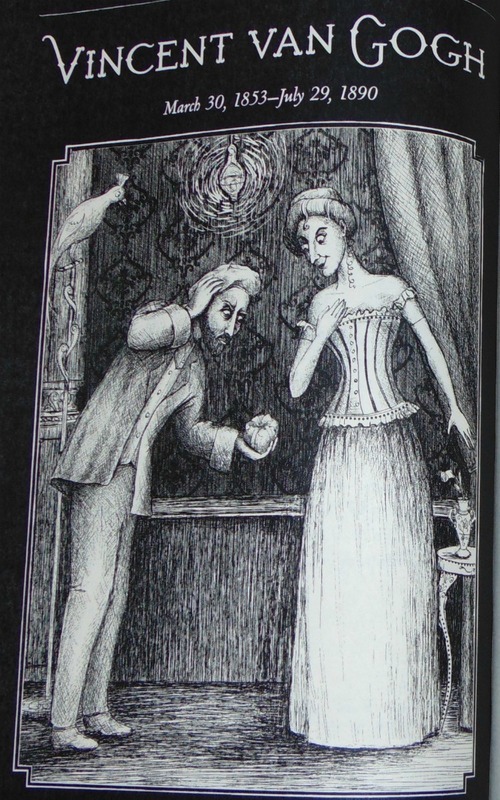 Scattered throughout the book are black and white images from Melba, her family, and the events of the day. 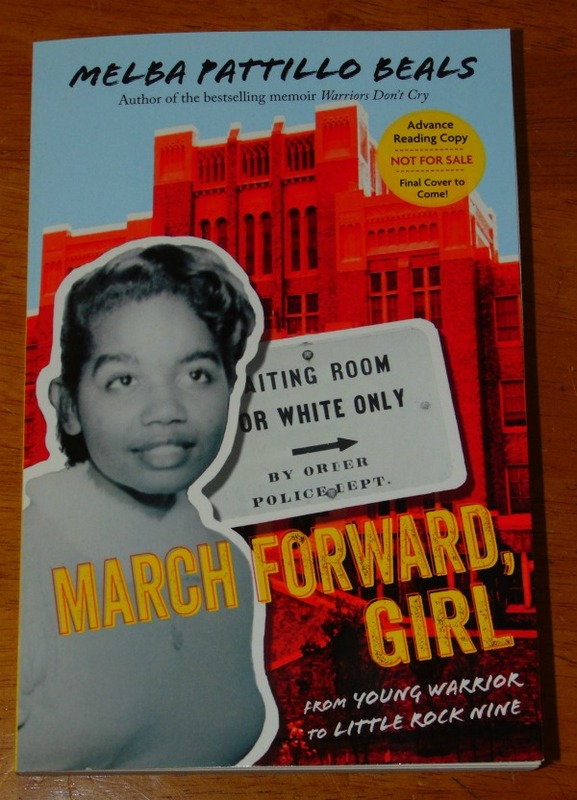 March Forward, Girl: From Young Warrior to Little Rock Nine. Imagine the possibilities…. see the potentials…realize the dreams. Step in the world of Once Was a Time. This great middle school read introduces us to Lottie and Kitty who are the best of friends… soul mates who understood each other full well. Believing in the possibilities, living out the realities of war torn England in 1940. 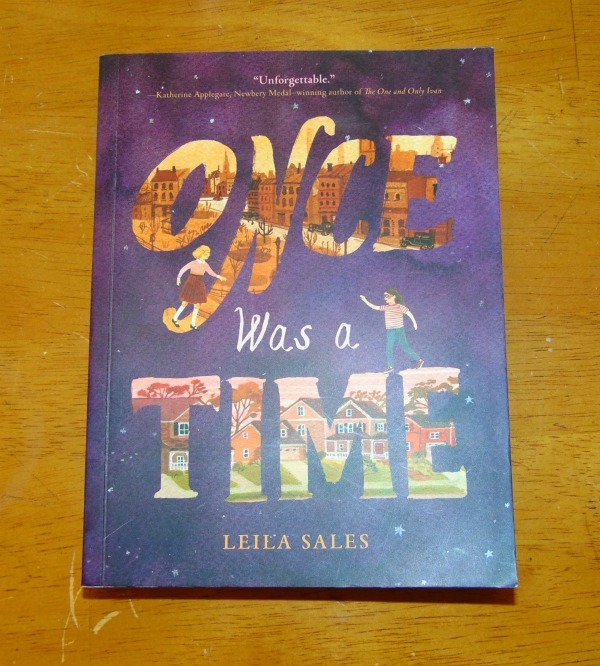 This was a well-written novel by Leila Sales, who has author several young adult books. Lottie and Kitty were so well described I felt as though I knew them and could fun with them. Girls with crazy imaginations, a willingness to accept each others foibles, and still stick together like glue. Leaving with dreams and plans, struggling with how their families were, dealing with the terror of war. Good characters. 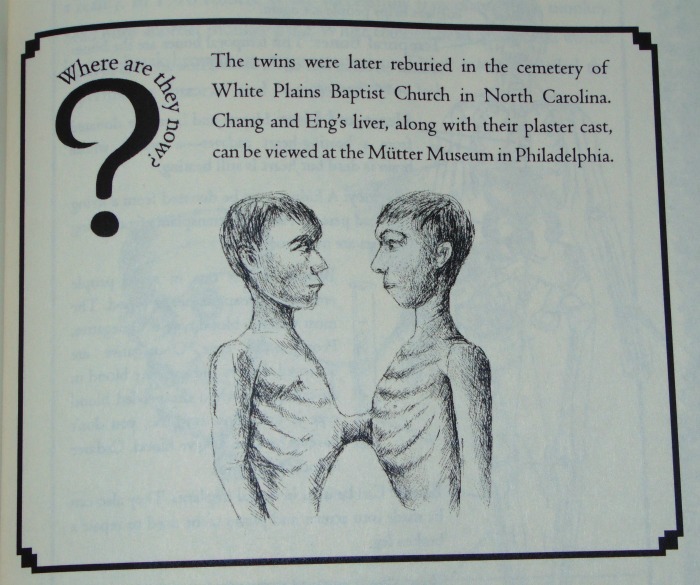 Then …oh.. the unimaginable happens, these two soul mates are separated. What would happen? How would Lottie manage? Would Kitty survive? What happens to their families? How their lives diverge is a fascinating tale of persistance and hope. And OH… I want to tell more but then I’d have to say SPOILER ALERT! SPOILER ALERT! And who wants that eh? 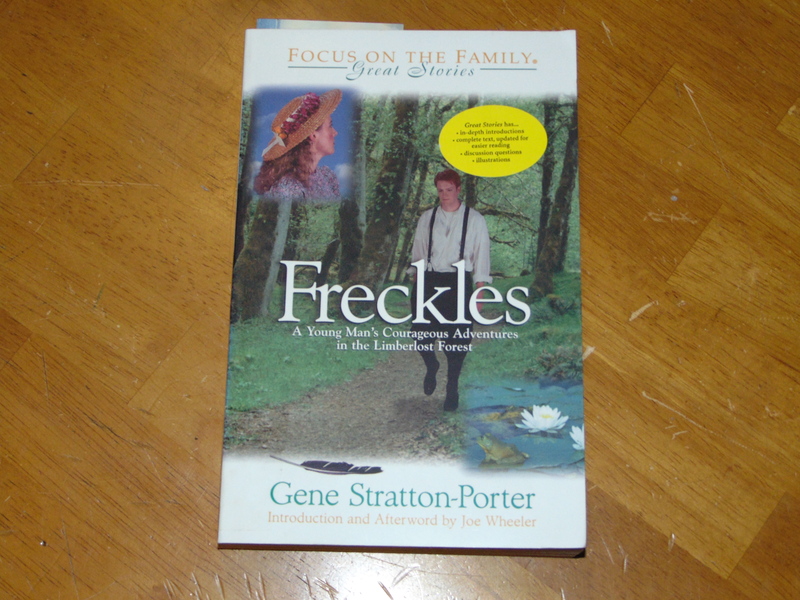 Themes covered: Time Travel, war, bullying, friendship, library, budgets, books..oh the books!, siblings, travel and more. A well crafted book quite suited for the middle school crowd. These characters will linger. Amazon.ca: Once Was a Time. Amazon.com: Once Was a Time. 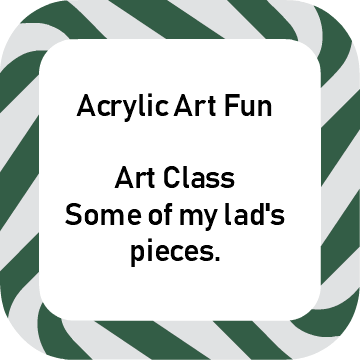 My lad’s been taking a class in Acrylic Painting, I thought I would show you some of the work he’s done. 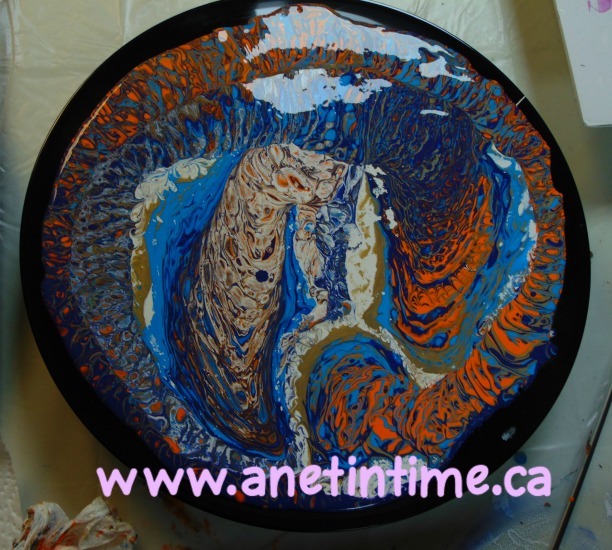 This was done on an old record. They mixed the colour in a cup with some glue??? (I think) and then put it on the record. Each student had their work turn out a bit different. I really liked how these tiles and light fixtures turned out. Rather cool eh? I just love the colours and hope that when we move we might put them up in the lad’s room. 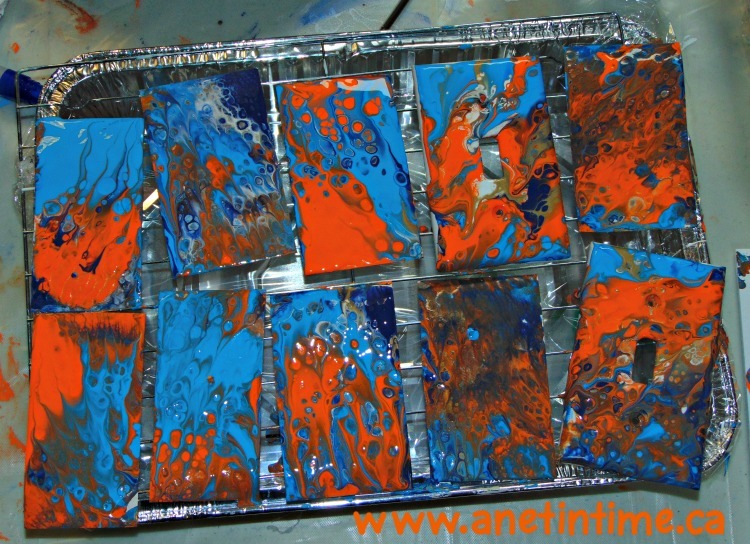 The splash of orange on the blue.. .Just really liked this!